This lets you transfer content from your for Xbox 360 20GB, for Xbox 360 60GB or for Xbox 360 120GB hard drive. The transfer cable is for transferring content between computer and hard disc, but it cannot transfer data from one hard disc to another. Xbox 360 Hard Drive Transfer Data USB Migration Cable . Dispatched with Royal Mail 1st Class. Genuine Microsoft Xbox 360 Hard Drive Game Transfer Data USB Migration Cable. Condition is used. Great for transferring cheats saves data pictures etc. Transfer Data from your Xbox 360 console to PC and vice versa. Supplied as cable only - software/drivers are required to use. (RESEARCH ON NET). Easily transfer all your data, just connect the USB cable to the USB port of your Xbox 360 hard drive disk and connect to any USB port on your personal computer. Use the 360 kit software tool (included) and you will be able to access and edit the files on the Xbox 360 hard drive. Xbox 360 Microsoft 60gb Hard Drive & Data Transfer Cable Lead Official! Xbox 360 Microsoft 60gb Hard Drive & Data Transfer Cable Lead Official!. Condition is Used.fully tested and working!!! Will need old data clearing!! Please see my other retro gaming items for sale!!! Cable Data Transfer Cord For Microsoft Xbox 360 USB HDD Kit. Dispatched with Royal Mail 1st Class. Genuine Microsoft Xbox 360 Hard Drive Game Transfer Data USB Cable. Condition is Used. Dispatched with Royal Mail 2nd Class. NOT COMPATIBLE WITH SLIM VERSION. Note:This is Xbox to PC not Xbox to Xbox. Transfer Saves, Downloads, User Data And More. It will not transfer data from the Xbox 360 e or Xbox 360 slim. ( it will transfer data to the Xbox 360 e and slim but NOT from the Xbox 360 e or slim). For sale genuine Microsoft Xbox 360 data transfer cable. Official Microsoft Hard Drive Data Transfer Cable Lead Xbox 360. Condition is New. Dispatched with Royal Mail 1st Class. 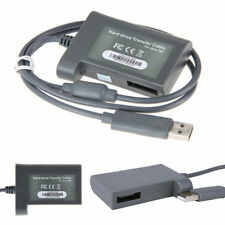 Features: For Xbox 360 Slim to PC, Adapter Cable, Easy to Use, Durable. Instant connection to your PC and for Xbox 360 hard drive. Compatible Model: For Xbox 360 Slim. Type: HDD Cord Kit. 1 x Data Transfer Cable. Back-up the Xbox 360 hard disk drive data to a personal computer (PC). Compatible with Microsoft Xbox 360 consoles. Not Compatible with XBox 360 Slim. Simple and fast data transfer using this cable adapter. (The easiest way to transfer data from the XBox 360 Slim HDD to the PC HDD. Compatible: Only for Xbox 360 Slim. (Not compatible with Mac.). 1) Put the XBox Slim hard drive on the transfer adapter. Included software tool to access and edit the files on the Xbox 360 hard drive. To be updated find ean.